He reviled the rich for their cupidity and they found his rhetoric repulsive. 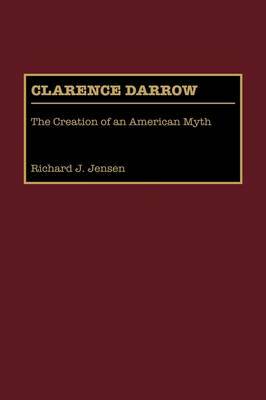 Plebians believed him their champion and patricians knew he was their bete noire, remarks Halford Ryan in his eloquent foreword to this definitive survey of Clarence Darrow's development as orator and unique American myth. As a writer, lecturer, debater, and trial lawyer Darrow spoke for the have-nots and cultivated an image of mythic proportions as the underdog's advocate. Many of the more than 2,000 trials in which he was active reflected the major social and philosophical issues of the last quarter of the nineteenth and first third of the twentieth centuries in America. Read today, Darrow's speeches still ring true both as political statements and as models of persuasive pleading and pathos--reason enough to study the work of this uncommon advocate who stood perpetually opposed to the great and powerful of the earth. Richard J. Jensen has written a clearsighted volume that documents how Darrow created and then enlarged his personal myth through speeches, writings, and actions. Each chapter focuses on particular segments of that creation. Half of the book consists of authoritative texts of several of Darrow's most influential and rhetorically brilliant speeches, and a speech chronology simplifies the work of researchers. The study opens with a brief biography, an overview of Darrow's rhetoric, along with the forces that affected it, and some initial comments on the elements that make up the myth. The next chapter, Schoolmaster of the Courtroom, chronicles the origins of Darrow's image as a defender of the downtrodden and his early trials in defense of labor unions and their leaders. What is considered to be one of the most famous speeches in American legal history, that given by Darrow at the conclusion of the 1924 Leopold and Loeb trial, is the focus of Chapter Three. Chapter Four centers on the Scopes Trial, perhaps the most famous trial in recent American history, during which the dramatic confrontation with William Jennings Bryan occurred. The penultimate chapter explains the arguments Darrow used to defend the poor, radicals, Blacks, and other less fortunate members of society. Finally, Darrow's rhetoric as a writer and as an active speaker and debater on the lecture circuit is examined. Part II contains the authoritative texts of seven speeches including those given during the Leopold and Loeb Trial and the Scopes Trial, among others. The Chronology of Speeches, Bibliography, and Index close the volume. The speeches along with Jensen's intelligent, readable analysis and criticism will be an important resource for those teaching and studying Legal Rhetoric and the History of Public Address.